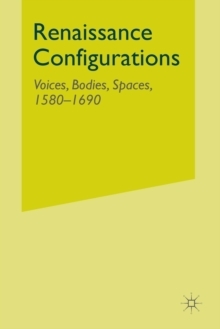 Renaissance Configurations is a ground-breaking collection of essays on the structures and strategies of Early Modern culture - as embodied in issues of gender, sexuality and politics - by a group of critics from the new generation of Early Modern specialists. The essays focus on the relations of public and private, of verbal and spatial, of textual and material, reading and re-reading texts, both canonical and non-canonical, with a textual and historical rigour often considered lacking in work with theoretical premises. The collection as a whole offers a clear sense of the direction to be taken by Early Modern studies over the next decade. Pages: 263 pages, XXIII, 263 p.